Diana were the wallpaper of the 80s and 90s. Constantly photographed at seemingly endless public engagements, designers flocked to dress her and women emulated her iconic style. Like millions of others, I also loved seeing Diana’s evolving wardrobe and I’ll never forget the day when I saw her in person. It was a sunny Monday afternoon in Hyde Park in July back in 1991. I was out for a walk and could hear Luciano Pavarotti rehearsing for his concert the following day. All of a sudden I saw a silver Mercedes stop nearby, the chauffeur opened the back door and a woman stepped out. She walked towards me and as she got closer I realised it was mildly disguised Princess Diana. I’d grown up knowing every stitch, every decadent detail of this woman’s clothes from an early age, so I was bewildered to see her slender frame before me, dressed in a loose, light grey tracksuit. But this is Diana we are talking about, and even in a baggy tracksuit, she still looked incredible. As she glanced up at me from beneath her peaked cap, I was entranced by her eyes. I got the full knowing look that we’re all familiar with, but it was so much more captivating in real life. I was struck by just how beautiful she was, with radiant skin and delicately manicured nails, and I immediately understood why she had such an impact on anyone that had met her. She chatted to a friend for a few minutes before getting back into her chauffeur-driven car and heading towards the Mall. David and Elizabeth Emanuel, complete with a 25-foot train. By this time, Diana was firmly established as a style queen, so it’s strange to think that when she first came on to the royal scene, she owned just three dresses. In her teenage years, Diana mainly dressed in the style of a shy Sloane Ranger or a prettier New Romantic. A frill here, a sensible knit there, with an occasional tweed jacket thrown in for good measure. She clearly enjoyed clothes back then, but didn’t give high fashion too much thought. It was at this point she was brought to the attention of the press, when she was first linked to Prince Charles. In perhaps the first television report about her while she was working as a nanny, she was filmed wearing a (now infamous) skirt and sensible blouse. As the sunlight caught her, the skirt became completely see-through. Whether or not this prompted a rethink about the way she dressed, when Diana entered the royal arena, she had a proper action plan. She realised that her diaphanous skirts and frills looked a bit cluttered in pictures and wanted to create a more streamlined look. Her first attempt to buy clothes fit for a princess was a bit of a Pretty Woman moment. Her mother sent her to Bellville Sassoon, a couture house that at the time was already dressing many of the Royal Family. Diana went into the couture house on her own, but Belinda Bellville and David Sassoon weren’t present and the shop assistant said that she couldn’t find anything for her – suggesting she went to Harrods. It wasn’t until Lady Diana Spencer left that the assistant was informed by a fellow customer who she was. Diana did indeed go shopping in Harrods and bought two dresses by an off-the-peg designer, Regamus, a “safe” brand that mothers would buy for their daughters to attend debutant balls. These dresses are currently on display at Kensington Palace and are rather froufrou with matching scarves in peach and mint green. A short time later, Diana was invited back to Bellville Sassoon, where Bellville was there to greet her, and her style then properly started to evolve. At about the same time, Diana was asked to be photographed for Vogue magazine. Her sisters Sarah McCorquodale and Jane Fellowes had worked there, so she was familiar with the environment, but that didn’t stop her being very shy on the day of her first shoot. She arrived, with a pink blouse in her bag to wear, unaware there would be several racks of clothes waiting for her. It was here she met Vogue’s fashion editor Anne Harvey, who handpicked the right designers to introduce her to, and became not so much her stylist, but more her advisor. Diana became quite hands-on in her own styling. There are numerous photos of her sitting on the floor with designers going through sketches and fabric samples. She also attended catwalk shows, and it’s evident from the current exhibition at Kensington Palace that includes many initial design sketches where you can see Diana’s handwritten scribbles of delight. On one particular sketch of a pink Bellville Sassoon dress, she wrote “Please!” It was a dress she went on to wear to Prince William’s christening. As her confidence increased and designers flocked to dress her, the press and public eagerly anticipated what Diana would wear next. One outfit that particularly made the grade was the floor-length ink velvet couture dress she wore to the White House, where she famously danced with John Travolta in 1985. The dance wasn’t planned, it was a spontaneous moment that was Nancy Reagan’s idea, but it was as if designer Victor Edelstein had known it was going to happen. The off-the-shoulder dress was perfectly moulded to the body down to the knee, where the velvet then generously flowed into a mini train. It was the perfect, fairy-tale moment. We all got to play dress-up with Diana. We couldn’t wait to see what she would do next. She would take a necklace and wear it as a headband or experiment with colours and prints. She dressed appropriately, but knew how to talk to people through her clothes. She also discarded gloves for royal occasions, saying she wanted to actually touch people’s hands when she met them – quite shocking in royal circles at the time. 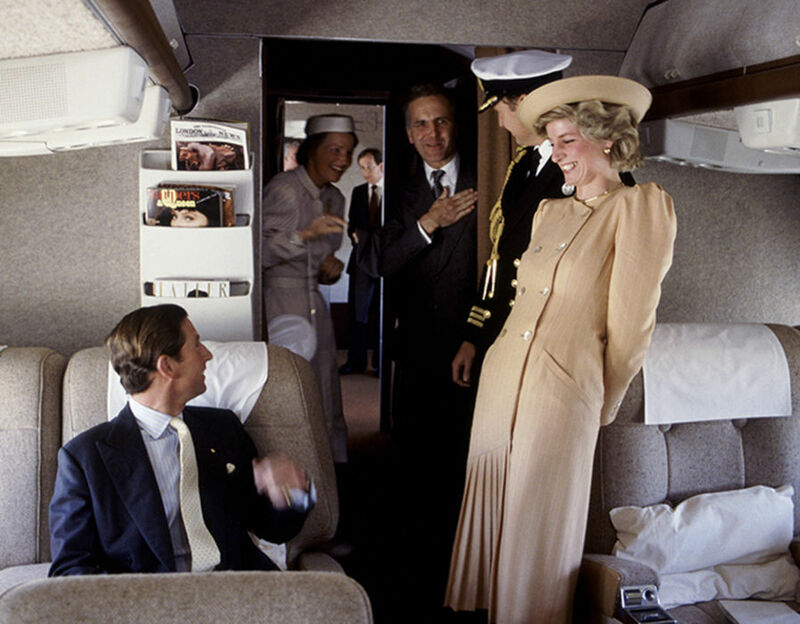 On royal tours, Diana would also make personal gestures towards the countries she visited. She had a dress embroidered with gold falcons (an emblem of Saudi Arabia) for a visit there and often wore colours to match the flags of the country she visited. “Diana was such a great style ambassador,” Cyrus explained. “She enjoyed clothes, had a wonderful figure and held a great sense of occasion. Diana supported many British fashion designers. Whatever she wore, the country followed suit, embracing her love of style details. She once wore bows on her tights and the whole country went into overdrive to buy them. As a result, hosiery companies saw a terrific boost in sales to fulfil demand. Style icons like Victoria Beckham have taken their love of fashion to the next level, creating their own collections, but however influential Diana’s style was, she didn’t dictate what she wanted to wear. “Diana was only minimally involved in the design process,” added Cyrus. “The briefs got shorter and shorter over the years. Fashion continues to evolve, but Diana is still referred to as a style icon by fashion insiders, partly because she was adventurous and pushed boundaries in what she wore. She was the first royal woman to wear trousers to an evening event, and perfected an androgynous tuxedo and bow tie look on a few occasions. Until then, only the actress Diane Keaton had really been able to pull off the look. It was a courageous choice maybe, but it was a treat to see Diana looking so sure of herself. She understood the confidence a great tailored jacket can give, and it became a wardrobe staple for her as a suit, or to smarten up a pair of jeans, which were of course always skinny or “Mom” style. Looking back, there are so may parallels between what Diana wore then and today’s key trends. The one-shoulder top has recently made a comeback, while the Bardot neckline has been a summer high-street favourite this year, showing women still love to reveal a hint of shoulder. Diana also loved colour. Twinning bright red and purple was a favourite, and colour blocking is still universal. Her love of tartan, tweed and anything heritage is synonymous with today’s Burberry runway collection. By night, Diana was a showstopper in metallics, sequins, embellishment and velvet, which are all still key favourites for the party-wear season. She loved sequins – an emerald-green dress by Catherine Walker that she wore to a charity ball in 1990 was designed to be iridescent under the flashlight of the camera – and it worked. The Dynasty-style shoulders and cut of the dress would hold its own on an Oscar red carpet today. Eleri Lynn, curator of the wonderful Diana: Her Fashion Story exhibition at Kensington Palace, sums up why Diana’s style is so relevant today. “Diana knew what suited her, and stuck to it. She rose above the ever-changing trends with a timeless and elegant style, but somehow she managed to look fashionable,” she said.